The IUF has welcomed a report in Bloomberg BusinessWeek which focuses on the appalling working conditions on palm oil plantations. As part of the Regional Framework Agreement with Chiquita, the IUF and COLSIBA have signed a new appendix which commits all three to ”developing a joint understanding on sexual harassment, so that this kind of harassment will not be tolerated in the workplace”. There is also a provision to work on “training strategies and sharing examples of good practice” and recognition that “every workplace must take necessary measures to ensure men and women workers have access to information about their rights in the workplace”. UN special rapporteur, Olivier de Schutter, has called on the Malawian government to give “serious consideration ..to the intrinsic relationship between wages and the right to adequate food” and to take steps to adapt the “absurdly low” national minimum wage to a living wage. He also called for collective bargaining to be applied in particular in tea, and for the right to organize to be respected. Since the assassination of opposition MP Mohamed Brahmi at the end of July (after Chokri Belaïd, the second opposition politician to be killed this year) Tunisians have been protesting in the thousands, calling for the dissolution of the Constituent Assembly. The Tunisian General Labour Union (UGTT) and its 600,000 members are in the forefront of the protests. Strange things happen at the SOTUBI factory in Tunis, Tunisia's largest manufacturer of biscuits of which Mondelez owns 49%. In January 2011, with the country in a state of insurrection, workers took responsibility for protecting the factory, their source of livelihood. Low wages are not the only problem in Fiji's sugar mills. At the end of July Samuela Sigatokacake was killed in a workplace accident at the Fiji Sugar Corporation (FSC) Lautoka mill. The Ministry if Labour has now confirmed that, despite management threats and harassment, the majority of sugar mill workers have voted for strike action in support of demands for higher wages. 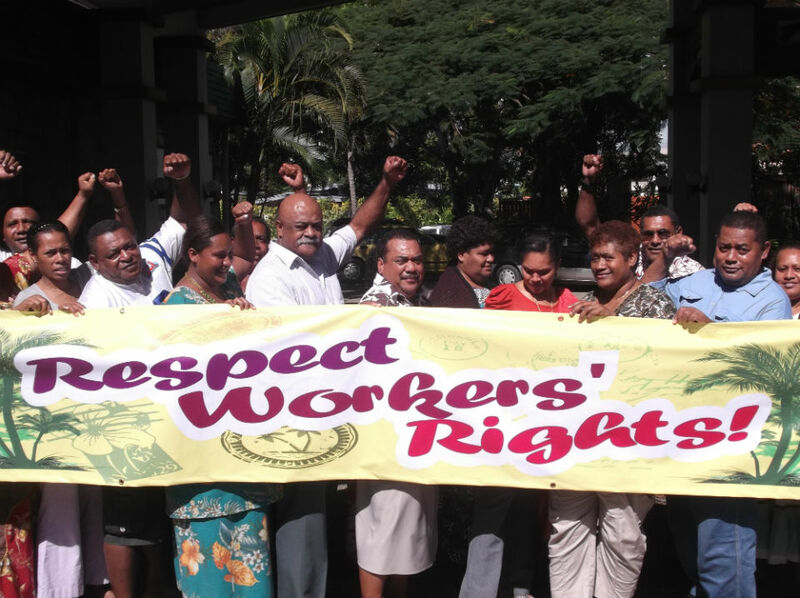 According to the IUF-affiliated Fiji National Union of Hospitality Catering and Tourism Industries Employees (NUHCTIE), Fiji's tourism sector employers are using the repressive political environment in the country to withdraw recognition and impose obstacles to collective bargaining. International hotel chains, such as Accor, are taking advantage of military dictatorship's repression of unions (click here for more) to increase precarious employment.